So, you have a ThermoClear machine (or similar) and you’re afraid to use it!? That was TOTALLY me when I first bought my machine! I was so nervous about using it, and I wasn’t entirely comfortable with the protocols… which probe to use, which technique to use, etc…. I have since worked on hundreds (thousands?) of people in my Studio and at shows across the US, and I’ve pinpointed the 5 most important questions you need to answer before you even turn on your ThermoClear! WHICH probe do I use? WHEN do I need to add a conductor (water, numbing gel)? HOW do I treat (technique)? But, before you go ANY further – you need to make sure you client doesn’t have any contraindications for treatment. As with any other procedure we offer as estheticians, we do NOT treat skin diseases, open wounds (duh!) or any suspicious lesions – when in doubt, send to a dermatologist! ALWAYS ALWAYS ALWAYS do your ABCDE’s of cancer detection before agreeing to treat ANYTHING! Pregnancy is a definite contraindication, as are any heart problems / pacemaker. In addition, it is very important to have a verbal conversation with your client to clarify the answers to all questions you ask in your consultation. The consultation is extremely important to determine contraindications or special needs that your client may have. Do not rely exclusively on the intake form; it is also important to verbally get information and clarification from your client. Metal implements in the body and pacemakers: Electricity will concentrate in areas with a conductor, and pacemakers will be interrupted. IUDs are considered metal implements for the purpose of electrical desiccation. Heart problems: A heart in a compromised condition is unable to cope with an increased constriction or dilation of blood vessels. This can lead to fainting or a heart attack. Blood vessel disorders: Arteriosclerosis, or hardening of the arteries, affects the arteries’ ability to handle increased blood flow. Fainting can occur when increased dilation of the blood vessels results from heat treatments. Skin inflammation: Most electrical treatments increase circulation, which could make inflammation worse. Skin disorders or diseases: These may be aggravated by treatment. Migraines or severe headaches: Treatment may cause worsening of existing headaches, but it is not known to cause them. Lack of tactile sensation (e.g., numbness due to stroke): A client impaired in this way will not be able to gauge the intensity of the current, which could cause injury. Nervous clients: Treatment will be ineffective if the client cannot relax. Botox: Administer no treatment until 72 hours after injection. Botox treatment paralyzes the muscle, so any treatment to stimulate muscle would be ineffective. Cuts and abrasions: Electrical current will concentrate in the area, because bodily fluids act as a conductor. Severe bruising: Bruised areas will be uncomfortable for the client. High or low blood pressure: These could be made worse due to the increase in circulation. Even if these conditions are treated and under control, use caution. Never leave such a client alone, and help them on and off the treatment bed. Recent scar tissue: Scarred skin is very sensitive and less resistant. Use caution when using electrotherapy. Treatment is allowable after six weeks of injury or surgery if there is no pulling of the skin. History of blood clots (thrombosis) or embolism: Treatment could aggravate these conditions and cause a heart attack or stroke. Malignant melanoma: Cancer treatment must be completed, and client must be in remission. Obtain physician approval. Do not apply treatment when in doubt about a possible abnormality; instead, refer the client to a dermatologist. * This is one of the benefits of using the ThermoClear machine over other machines of this class on the market today. 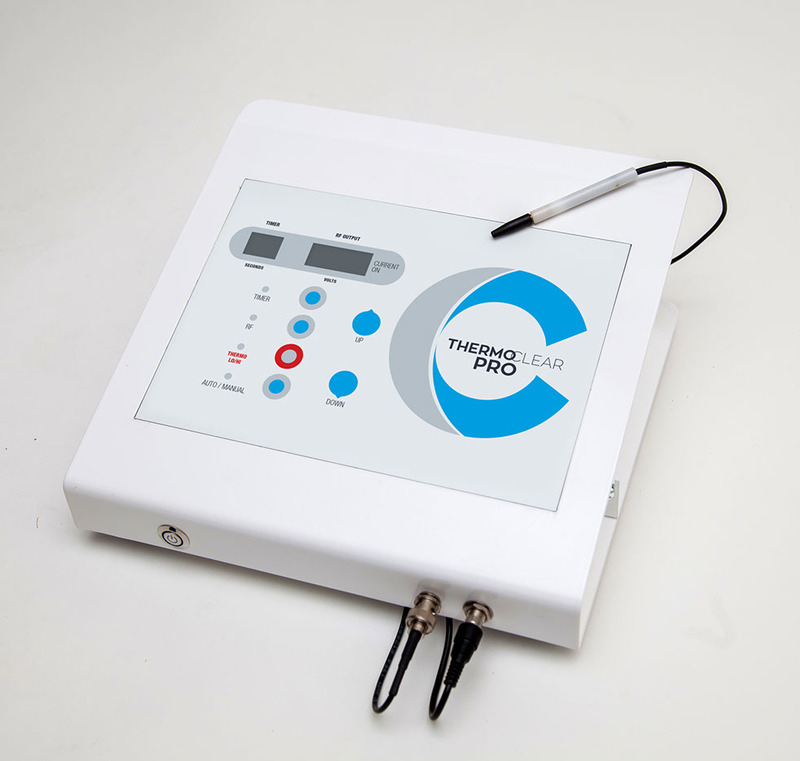 ThermoClear offers both high AND low radio frequency. What does this mean for your sensitive clients? It means you can TURN THE MACHINE DOWN to make the treatment more comfortable for those clients! 1. WHO am I treating? Look at your client’s skin. Does (s)he have a Fitzpatrick skin type of 4 or greater? Does (s)he have sensitive skin, thin skin or aging skin? These are all clients that will need the machine turned down lower than those with a lower Fitzpatrick skin type or those with tougher, resilient skin. Keep these points in mind when you decide which setting to use on your client! 2. WHAT am I treating? In order to figure out which probe to use, if you’ll need a conductor and which technique to use you’ll need to know exactly what it is you’re treating. Are you treating something that contains sebum or blood, such as sebaceous hyperplasia, milia, cherry angioma or spider capillaries OR something that does NOT contain blood, such as a keratosis, flat hyperpigmentation or a skin tag? And remember – if you don’t know what it is, DO NOT TREAT! It is always wiser to be safe rather than sorry! The answer to this question will help you decide the answer to the next few questions…. 3. WHICH probe do I use? Your ThermoClear machines comes with 2 different probes – an insulated probe (F3I) and a stainless probe (F6R). Both probes have an “F” shank, and any “F” shank probe will fit in the machine. There are several different sizes, but the most commonly used are the insulated .003-.004 and non-insulated .005-.006. The easiest way to remember which probe to use is if it’s a skin tag or large fibroma, you’ll use the stainless probe (in the blue box). For everything else, you’ll use the insulated probe (in the green box)! Keep in mind, there are other sizes of probes that you may be interested in purchasing. For example, if you are treating a large skin tag, you may choose to use a larger probe (F10S) so you can treat faster to make the treatment more comfortable for your client. 4. WHEN do I need to add a conductor (water, numbing gel? ), or does what I’m treating already contain a conductor? Anything that already contains blood or sebum (cherry angioma, spider capillary, sebaceous hyperplasia or milia) already contains a conductor for electricity, so there is no need to add an additional conductor (water or numbing gel). In fact, if you add an additional conductor, the treatment won’t be as effective as if you just use the blood or sebum that is already present. If what you are treating does NOT already contain blood or sebum (keratosis, flat hyperpigmentation or a skin tag) you will need to add a conductor in order for treatment to be effective. I always choose to treat the imperfections on the face that already contain a conductor (blood, sebum) first, and then if there is anything that does need a conductor – I treat that last. My reasoning is if I use a conductor first, and then find something to treat that doesn’t need a conductor and I start to treat it, the electricity doesn’t know that it’s supposed to not be following the path of least resistance and will not treat what you’re trying to treat as effectively! For example, I’m treating some capillaries and a some hyperpigmentation. If I put a conductor on the hyperpigmentation and then start to treat capillaries that are in the same area, the electricity will travel along the conductor AND the capillary, instead of just where I want to treat – which in this case is the capillary. 5.Once you know who you’re treating (and therefore your voltage), what you’re treating, the probe you need to use and whether or not you need a conductor, you need to know HOW to treat! You will use either a tapping or a scratching technique, depending on what you are treating. When tapping, hold the probe more like a pencil and use just the tip. When scratching, hold the probe more like a paint brush. There are several parts to this point. CAPILLARIES: If what you are working on is ‘red’ and contains blood, you’ll use a tapping motion. DO NOT TREAT PURPLE, GREEN or BLUE CAPILLARIES! They are usually too large and too deep and you won’t get a good result! These larger capillaries should be referred to a medical vein expert. In the case of a capillary you will start at the smallest or thinnest part of the capillary and work toward the largest or fattest part – thin to fat. In general, this will mean that you’re starting from the midline of the body and working to the distal areas. And remember, you’re not trying to sink the probe into the skin! On the contrary, you’re using just enough pressure to ensure a good contact between the probe & the skin and you’ll wait to see a white ‘blanching’. = Once you see that you have adequately treated that area you can move on. But keep in mind – It is important to make sure you have fully treated an area (especially with capillaries) before moving on to your next point of contact. If you move on too quickly you won’t have fully treated an area, and your result will not be as good. So, don’t rush! (This is something I see so very often with new practitioners – they dance across the skin instead of using slow, steady movements.) If you find yourself rushing remove the probe from the skin, take a deep breath and remind yourself to TAKE YOUR TIME, and continue. You will get it! CHERRY ANGIOMAS: In the case of cherry angiomas you’ll start at the outside of the spot and work in a circular or spiral motion toward the inside of the cherry. It will literally disappear before your eyes! Once again, look for the blanching because you won’t want the cherry to come back! SEBACEAOUS HYPERPLASIA: When you’re treating sebaceous hyperplasia you’ll also work in a circular or spiral motion, but this time you’ll start close to the hole or ‘donut’ center of the hyperplasia and work toward the outside of the hyperplasia tapping and solidifying the fats in the hyperplasia until you no longer see it turn white. You don’t want to treat the center, as there is no sebum there and can result in a divot where you’re treating instead of the smooth surface you’re trying to produce. After you treat you’ll see a lot of white material, which you can then scrape off with your Dumont diamond tipped tweezers. MILIA: When treating milia you’ll just put the tip of the probe on top of the milia and tap, tap, tap until the material rises to the top. You can once again use your Dumont tweezers to scrape out the material, or some estheticians use a comedone extractor to remove. HYPERPIGMENTATION / KERATOSIS: When treating browns (and by this I mean hyperpigmentation or keratosis) you’ll use more of a scratching or hash-tag technique. The point here is not to treat the entire brown spot, but to scratch small lines as if you’re painting instead of tapping with the point of a pencil about 2-3 mm apart in a pattern like a hash-tag mark or like this #. The idea is to leave some ‘good skin’ in between the areas that you treat. Because there is no conductor in hyperpigmentation or keratosis, you would want to make sure you add a conductor before treating. SKIN TAGS: Skin tags are a bit different. They lack blood supply and sebum, so you need to use a conductor, but you need to use more of a tapping technique on the stalk (and ONLY the stalk – there is no reason to treat the skin surrounding the stalk). Once the stalk is completely treated, you’ll then do a combination of tapping & scratching the actual tag until it shrivels up like a raisin! Leave it alone and it will turn black and fall off within a day or so. If the tag is in a sensitive area, you can cover with a Band-Aid to protect it from rubbing. With these tips you’ll be well on your way to treating your clients safely and with a great deal of skill. Don’t forget – everyone’s skin is different, and it’s more important to THINK about what you’re doing than follow a laminated sheet that tells you what setting to use for each particular imperfection you’ll come up against. If you just systematically THINK through your steps, you’ll be able to treat everyone quickly, safely & with little discomfort!